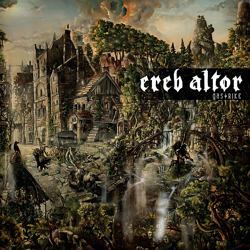 Swedish epic Viking doom metallers Ereb Altor will release their 3rd full-length album on June 29th via Napalm Records. Their new work will be entitled “Gastrike” and it is much more brutal and aggressive than its highly acclaimed predecessor “The End“. Their epic hymns have been enriched with a good portion of black metal elements, comprising of furious blast beats, thundering double-bass and aggressive vocal parts. However, the Swedes have not forgotten their traditional elements. Hypnotic melodies and sweeping parts flow into each other, creating a highly beautiful and rewarding listening experience in which melancholic hooklines and moving vocal lines play a pivotal role.